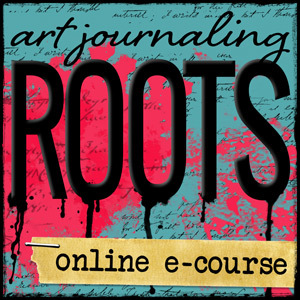 Roots Art Journal Flip Through! In this video, I share a few pages in my journal to give you an idea of what we create in my e-course ROOTS. But every journal is different, as unique as its creator, and this is what I encourage in the course. I guide you in creating a journal for yourself, but don’t limit you in terms of what that will look like. My belief is that the more you can play, experiment, and do this for yourself (instead of doing it to show others), the more powerful it will be for you. Art journaling can be an amazing tool to develop a deeper connection with your true creative self, and allow more clarity, happiness, and self awareness into your life. My hope is that ROOTS gives you the tools and the foundation to develop this type of transformative art journaling practice. I’ll be teaching Roots for the last time this February! 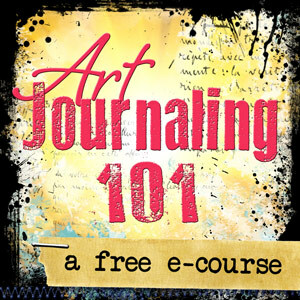 In this 7-week online e-course, you’ll develop your own transformative art journaling practice as we let go of comparison and open ourselves up for self-exploration. Want to learn more about the class or see some pages by past students? Check out the information page HERE. I hope you’ll join us! Hi Kristal, I enjoyed you showing your journal in the video. I’m wondering if you glued the pages together in the composition book journal that you showed? The paper is quite thin, and did you apply gesso over your pages? Appreciate your answering my questions. Susie, if scribbling or slapping paint around isn’t your thing, then maybe it’s just not your thing! Art journaling is all about embracing who you are, and doing what feels right for you without the worry of what others may think of it. :) If you’re feeling like you need to “loosen up” because you are stressed about what others think, or because you put unnecessary pressure on yourself to make it “perfect”, then yeah, perhaps some exercises in openness or practicing being seen may be helpful. Listen to your heart. Let your journal be a place to hear what it really needs. I’m sure glad I taking this course, I’m one of those people that get so overwhelmed by all the techniques, all the special supplies, and beautiful drawings and paintings, I am actually tired of looking at videos and magazines because they make me feel like a failure…(my art looks bad compared to theirs). I want to learn to do my own thing that I enjoy, afterall it’s only for me. They make me feel guilty when I don’t use all the paint and techniques they do…….but I really love my colored pencils, markers, crayons and watercolor pencils too, these are my favorite. So excited to start Roots !